This Saturday's performance is sold out! It is sure to be as great of a hit as last Friday's sold out show. Thank you to everyone for coming out and enjoying the evening with us. If you missed seeing our summer gala, be sure to check in late summer as we may plan a fall gala. If we do, get your tickets early! The stables will be open to the public this Saturday and Sunday between 10:00am and 1:00pm as part of the Hills of Headwaters Stable Tour. Thank you to Equine Canada for involving us in Horse Experience 2015. See the link below to catch a glimpse. We hope you can join us for one of our upcoming summer galas over the next two weeks! 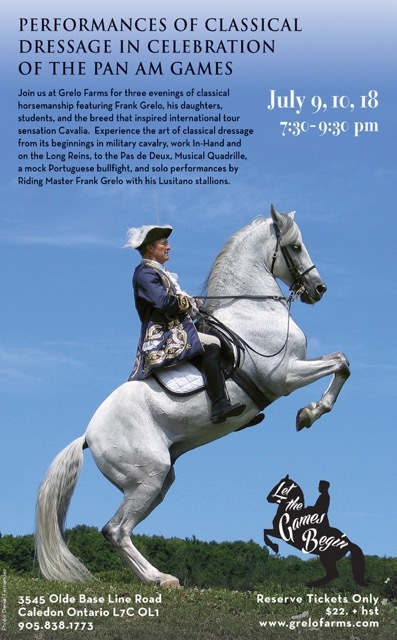 Featuring performances by Frank Grelo on beautiful Lusitano stallions accompanied by his students. Experience the art of classical dressage from its beginnings in military cavalry, work in-hand and on the long reins, to the Pas de Deux, musical quadrille, and a mock bullfight. We are a part of Canada Equine's Horse Experience 2015 and the Headwaters Stable Tour. Visit our stables July 11/12 and 18/19 between 10:00am-1:00pm to see the morning exercises and regular life at Grelo Farms. Join us for a small clinic from 2:00-6:00pm. To book your ride or ticket, contact Tanja at academicequitation@outlook.com or 226.791.2284 (cell). It's a new year, the Pan Am Games are coming to our town and it's a good time for aspirations. Here's a video to kick-start some enthusiasm!